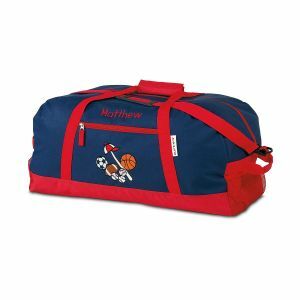 A winning choice, dense 600-denier 100% PVC/polyester, spot-clean bags feature webbed handles, red trim, and appliqué accents. Adjustable padded shoulder strap, side handles, front zip pocket, and two side mesh pockets. 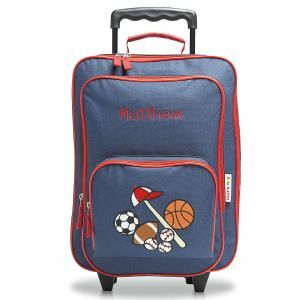 23"L X 12"W X 11"H.
Perfect for kids on the go, this rolling travel bag is ideal as a backpack for school, or as a cool little travel bag. Get quick access with wrap-around zipper, making it easy to pack or store things inside. 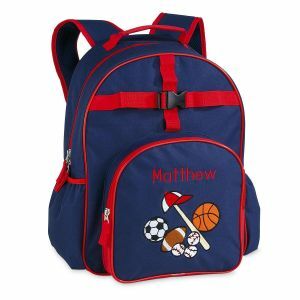 This made-to-last bag is crafted of sturdy, double-stitched, wipe-clean, 600-denier, PVC-backed polyester. Quality constructed bag features a cushy padded back, durable smooth-rolling plastic wheels, comfort-wrapped webbed handle, and zip pockets. A winning choice! 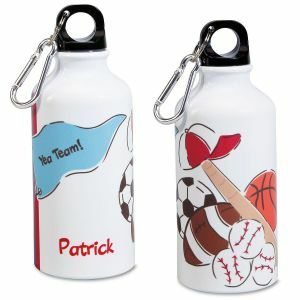 Personalized, dense 600-denier 100% PVC/polyester, spot-clean bags feature webbed handles, red trim, and appliqué accents. Double-zip main section, outer zip pocket, side pouches, & adjustable padded shoulder straps; 6" x 13" x 16"H.
Soft, comfy, calf-length navy fleece robe that has shawl collar, attached self-tie belt, patch pockets, and embroidered and appliqued sports balls. Flame-resistant poly. Imported. Machine wash/dry. Name is custom embroidered.